Ford V8 (Germany) car poster, 1938. Homepage. This page: A sales poster from the late 1930s advertising Ford's V8 in Germany. Original photographs of V8 Fords of the late 1930s have been included within the image section of the site for some years now. The old b&w images in question may be found on this page. Here though is a factory-issued poster from 1938. I bought a pile of old papers years ago, and rooting through a file today I re-discovered this slightly tired poster. It must be quite a rare item of ephemera now, especially as it promotes the Ford V8 within the German market, as opposed to the American or British sales arenas. The text below the image reads "KATALOG UND VORFUEHRUNG KOSTENFREI AUF WUNSCH", which loosely translates to "Brochure and presentation pack available for free on request". I wonder which dealer handed out this poster ... and to whom? 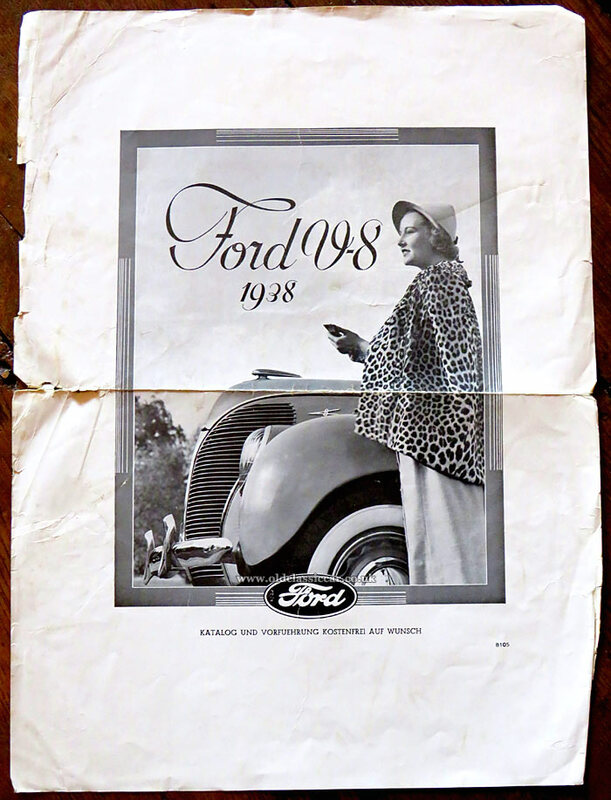 References to Ford's eight-cylinder cars of the late 1930s can be found in various locations across the site. Photos appear on the link mentioned already. On this page there's a sheet of V8-themed letter paper from France, dating to the early 1930s.